FIGURE 3-13 Model of the interaction between corticotropin-releasing hormone (CRH) and the adenylate cyclase system showing the action of ketoconazole, which is representative of the imidazole derivatives. 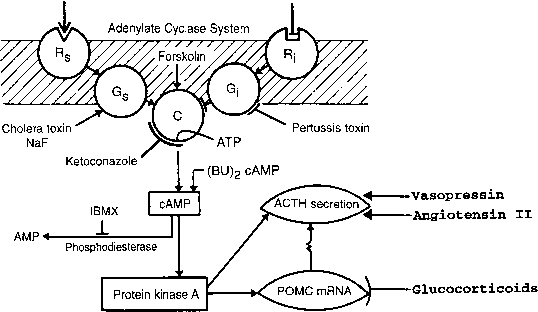 Abbreviations: AMP, adenosine monophosphate; ATP, adenosine triphosphate; C, catalytic subunit; cAMP, cyclic AMP; Gj, inhibitory guanosine triphosphate (GTP)-dependent protein system; Gj, stimulatory GTP-dependent protein system; IBMX, isobutylmethylxanthine; NaF, sodium fluoride; POMC, proopiomelanocortin; Rj, inhibitory receptor protein; Rs, stimulatory receptor protein; J,, stimulation; _L, inhibition. Reproduced in part with permission from Stalla, G. K., Stalla, ]. P., Loeffler, J. P., von Werder, K. and Muller, O. A., Pharmacological modulation of CRH-stimulated ACTH secretion by ketoconazole in Pfeiffer, E. F., Reaven, G. M„ Hetzel, W. D., and Hoffman, A. R., eds. (1987). "Corticotropin Releasing Hormone" (O. A. Muller, guest editor), pp. 31-36. Georg Thieme-Verlag, Stuttgart.